Rigid production lines excel at crafting uniform, standardized products—but more often than not, customers are expecting to have the option to customize their products or request something different than what is offered to them. As a result, manufacturers are needing to develop one-off, tailored creations for their consumers. To effectively accomplish this without disrupting mass production, suppliers need to leverage cloud-based tools that allow them to seamlessly create personalized products at scale. Emerging Industry 4.0 technologies, such as intelligent robotics applications or product neutral equipment, can connect to a cloud server that directs them to actions dependent on specific bespoke production actions. By implementing versatility into the production line, manufacturers can eliminate the limitations typically associated with mass production lines. David, the supply chain manager of a shoe manufacturer, must account for custom orders created by customers on the brand’s website. In order to meet the demands of bespoke product creation while ensuring minimal time to fulfillment, David must be able to manage a flexible inventory of raw materials to handle multiple shoe variations, while ensuring enough supplies are on hand to support mainstream production runs. A group of customers submit their bespoke sneaker designs using the brand’s digital creation software that enables them to choose from a variety of styles, materials and colors. These custom designs are communicated directly to the manufacturing plant, where an AI-powered platform manages the custom requests as they come in and provides appropriate instructions to the necessary equipment. Thanks to cloud connected hardware, manufacturing operations are able to seamlessly produce one-off creations, alongside their mass production lines. As these customer orders come off the production line, they are packaged with RFID tags and sent to a packaging center. This generates an automatic email for each customer that includes a link to view the status of their shipment and a picture of the finished product. 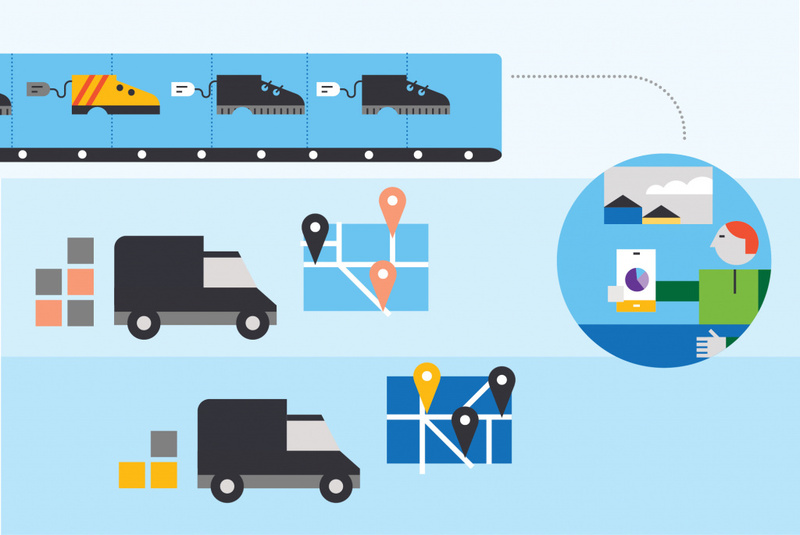 To keep shipping costs to a minimum, a backend logistics software is used to track the custom orders, ensuring they make it onto bulk shipments that are heading to distribution warehouses that are in closest proximity to the final delivery address. As custom orders come in, an AI-program tracks all styles, materials and color choices, weighing them alongside key trends from the worlds of fashion, sports and entertainment to produce an aggregate data model that predicts which supplies will be in high demand in the near future. With an anticipated spike in the demand for blue suede, the platform analyzes current material inventory and incoming shipments, alerting David and suggesting he revise his most recent order to avoid shortages. This same data is also sent to the company’s R&D teams to influence their ongoing innovation pipeline, ensuring they stay ahead of the most popular style trends and capitalize on consumer demand. Manufacturers anticipate that innovations in flexible automation will experience 4% to 10% growth leading up to 2020. Manufacturing production has recently grown at its fastest pace in more than a decade, creating more economic value per dollar spent than any other sector. Adding to this surge is customization — the ability to quickly and efficiently make what you want, when you want it. [The digitization of products and services] not only greatly increases the ability to respond flexibly and more rapidly to customer demands, but also to anticipate demands, helping customers get ahead of themselves in a range of predictive ways. What Trends Are Driving This? Click here to download the full free report, with expert insights, key scenarios and enabling technologies. In partnership with Microsoft, PSFK presents the Future Of Manufacturing report, an opportunity playbook that explores a new era of supply chain management and the technologies that enable faster, more agile manufacturing operations. Tune into psfk.com for a 10 week in-depth look at expert insights, key findings and detailed scenarios, or download the full report here.